Home » Editorial » COLUMN: Is Mayor Steve Williams Unbeatable? COLUMN: Is Mayor Steve Williams Unbeatable? It's been a stormy year for Mayor Steve at times this year but, he has walked through the storm without barely even getting wet. Yesterday, he filed to run for re-election as Mayor of Huntington. Despite his involvement in "Sickpaygate", in which the West Virginia State Police investigated his $34,000 payout for sick pay to a police chief who was leaving leaving for a better job; Mayor Steve appears unbeatable in his quest for a second term. 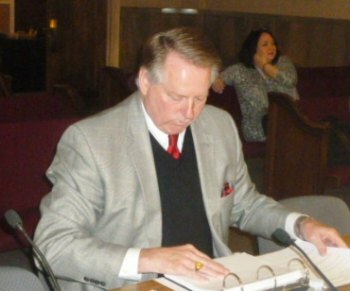 Many residents accused him of trying to fix Huntington's deteriorating infastructure on the backs of the working poor when he raised the city's user fee. In his election bid in 2012, he promised he would not create or raise any taxes or fees but has gone against his word on a few occassions with the implemention of "the rain tax" and the raising of the user fee. Mayor Steve has also created several new postions and grown Huntington's government since his election. But, Mayor Steve has been a fierce fighter against the drug epidemic. The drug epidemic has been Huntington's 911 and claimed 70 lives and had over 900 reported overdoses in 2015. Mayor Steve has been a fearless leader during this battle. He has not turned away from the constant every day fight mounting the war wagons with grant money, prayers, town meetings, and establishing treatment facilities. Mayor Steve has also been in the middle of Downtown Huntington's revitalization. He has been instrumental in bringing new projects that promise growth for Huntington in the near future. A master public relations man, he is always where the cameras are. He has a immaculate image and it would be impossible to find anyone in Huntington who looks more mayoral. Anyone who would attempt to beat Mayor Steve in 2016 would be wasting their money and time. Huntington votes for familiar names and it is hard to find a name that has mention more times in Huntington the last few years than Mayor Steve Williams, he is virtually everywhere all of the time. Mayor Steve , a very professional man who may have a chance to win a higher office someday,is beatable only by his inner demons. It won't be an opponent who tops Mayor Steve. The only person who can stop Mayor Steve is Steve himself.